Atheists will sometimes tell us that atheism is not a proposition, and as such, it can neither be true nor false. Since it is just a reflection of one’s psychological state (lacking a belief in God) to suggest that atheism were true or false would be to commit a category error. One can understand why it is that atheists have shied away from defending atheism or even holding that it were true. It seems that Christian apologetics have pushed atheism so far into a corner that they are afraid to utter the words that atheism is true. This is because if atheism is true, it follows that atheism is false. For the sake of the argument, this article will treat atheism as the proposition that God does not exist. If that proposition is true, it would follow that it is false. Of course, a proposition cannot be both true and false simultaneously. I am not saying that atheism is both true and false in the literal sense. Both A and not A cannot be true at the same time and in the same way. 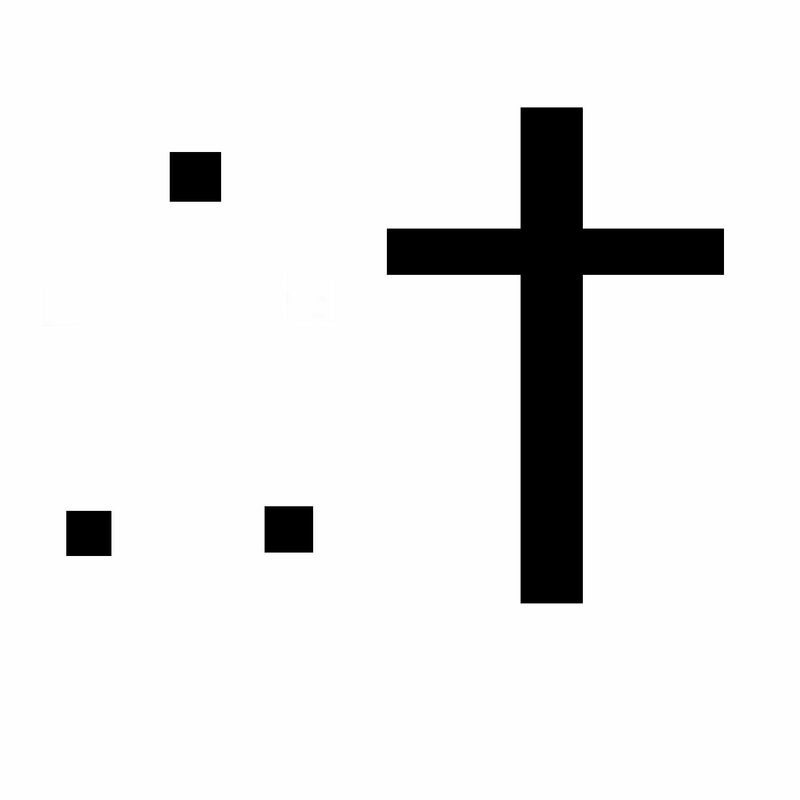 This is a rhetorical point meant to illustrate that if atheism is true, that assumes that there are true propositions. But true propositions assume the existence of God. 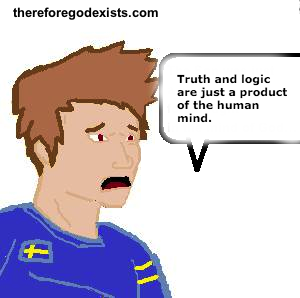 Therefore, if atheism is true, it follows that atheism is false. The argument may be framed thusly: (Premise one) if God does not exist, true propositions do not exist. (Premise two) True propositions do exist. (Conclusion) Therefore, God exists. This point may seem like it is something that is non-controversial. Nobody could really deny the existence of true propositions. However, many have submerged into the post-modernist chaos that denies that anything at all is true. But it does not take a philosopher to recognize that some things must be true by definition. It has become almost a cliche among Christian apologists to point out that “there are no true propositions” is a true proposition that is claiming to be true by itself. In fact, it is claiming to the exception, to be the only true proposition (which, of course, is special pleading). True propositions must exist, because you have to use true propositions to assert that they do exist. Just so the reader does not think that this is some sort of wordplay, the same problem would arise even if we use different terminology. If somebody were to propose that the truth value in all propositions was relative, then the truth value in that very proposition would be relative. Similarly, if an individual were to suggest that something could be true for you, but not for them, they would be saying that the principle, “true for you, but not for me,” was true for everybody. No matter how you phrase it, the relativistic principle is self-referentially absurd. It cannot be proposed without shutting itself down. Similarly, there are certain propositions that must be true because our lives, thought patterns and interactions are based upon them. Without these propositions, all of reality would literally be absurd. Perhaps the most obvious example of this is the law of non-contradiction. Both A and not A cannot be true at the same time and in the same way. If a relativist does not grasp the force of the law of non-contradiction, then perhaps you can illustrate that for them. If they say, “The law of non-contradiction is invalid,” reply, “So you think the law of non-contradiction is valid.” The only recourse would be for them to say, “No, you have contradicted me!” But why should that be a problem if the law of non-contradiction is not a valid principle? Some may try to conjure up counter-examples to the law of non-contraction, and we would be forced to use the same tactic. We could say, “So, you think this is an invalid counter-example?” and the point out be crystalized. Further, there are far more laws of logic that are not limited to the law of non-contradiction. We appeal to them constantly. Even the relativist must use basic deduction and induction to infer relativism. The only way for anybody to be a consistent relativist would be to be abandon reason, logic (for therein are true propositions) and be literally unreasonable. Therefore, the relativistic position is unreasonable. There must be logical laws and consequently true propositions. Imagine for a moment that a man was arrested for murder and brought to trial. The prosecution was confident that he was their killer because they found his DNA on the murder weapon and on the victim. However, the defense attorney mounts the case that the defendant’s DNA changes. While it may be identical to the DNA that was found on the crime scene today, it was not identical yesterday. Now, this would violate physical laws. DNA does not change. However, the proposition, “DNA does not change” is asserted as a true proposition. If the members of the jury were relativists, they would be forced to concede the point. One cannot say that this man’s DNA did not change. There are no true propositions, after all. This doctrine would have devastating effects on the science of genetics. All forensic analysts for every police department would have to find a new skill set. Similarly, if an atheist were to say that they believed in evolution on the basis of the evidence, I would have to ask when they looked at the evidence. Perhaps it changed. Perhaps something about common descent has changed. Perhaps common descent was true yesterday, but it is not true today. Perhaps the evidence supported it yesterday, but it does not support it today. This is what relativism leads us to. True propositions are interwoven into all scientific data. If they are undermined, all fields of science (and not only science, but every discipline) would be rendered obsolete. Isn’t It All A Matter of Interpretation? Relativists often mount their case on the basis of the flawed human mind. As human beings, we have certain limitations. We may think that we can see something clearly and yet find out later that we are totally wrong about that piece of data. This will lead them to conclude that there are no true propositions. There are a few problems with reasoning worth pointing out. First, even if human reasoning is so flawed that it cannot grasp any true propositions, it does not follow that there are no true propositions. Second, the success of scientific naturalism entails that human beings do have a grasp of true propositions. Technology and engineering have taken humanity a long way. Today is marked by greater convenience than has ever been known in history. The average modern man lives in as great of, if not greater luxury than the kings of old. The material cause of this is scientific naturalism. From this it follows that we do have a grasp of true propositions. That grasp may not always be firm. It may frequently slip out of our hands. (In fact, that is why the scientific method was developed by the Christian scientist, Roger Bacon). But we do have a handle on true propositions. Is man the measure of all things? That is the flag that atheists will likely begin to wave at this point. While true propositions certainly do exist, they are not the result of some sort of transcendent standard. Rather, true propositions and the laws of logic are useful fictions that mankind has conjured up to develop society. But there are several problems with this idea. First, true propositions existed before mankind existed. Before there were any human beings, the proposition, “There are no human beings” was true. There may not have been anybody to make that proposition, but it was true nonetheless (just as it is true that I am writing an article despite that nobody is proposing that I am presently writing an article). The proposition that “The earth is round” was still true before human beings existed. The roundness of the earth is not contingent upon human beings. Second, the laws of logic existed before human beings existed. If they did not, then we could say that human beings existed before they existed. We could say that dinosaurs both existed and did not exist. We could say that the earth was both round and flat. The universe must have been a bizarre place before we showed up and straightened everything out. This idea that we are the measure of all things and that true propositions are contingent upon us is highly anthropocentric and clearly false. We have established that true propositions exist and that they are not contingent upon human beings. So, where are they? Can we find them, put them under a microscope and examine them? Can we look through a telescope and see a collage of all of the true propositions so that we may determine their nature? What are they composed of? Where are they? Have they always existed? Did they exist without the universe? Imagine for a moment a possible world in which the universe did not exist. Would the proposition “There is no universe” be true? Of course it would. If it was not true, then the universe would exist. Similarly, what if all of nature did not exist? The proposition “Nature does not exist” would still be true. Not only that, but if time did not exist, the proposition, “Time does not exist” would still be true. True propositions are therefore a metaphysical reality. They are not part of the natural world. They are beyond time, space, matter, energy, and even nature. From this, it should be obvious that it follows that metaphysical naturalism is false. Of course, metaphysical naturalism is not necessarily atheism. I have defined atheism only as the position that God does not exist. So it may be the case that atheism is true and metaphysical naturalism is false. After all, I am sure you are thinking by this point, wouldn’t the proposition, “God does not exist” be true if God did not exist? Are True Propositions Just A Brute Fact? You may begin to think that true propositions just exist, and that is all. They really do not need to have any sort of explanation. Even if we accept that they are a metaphysical reality, they do not need an explanation. Well, there are a number of problems with this. First, everything that exists must have some sort of explanation. As Alexander Pruss pointed out, you cannot just deny the principle of sufficient reason like a hack when it takes you to your destination. Even metaphysical realities, like true propositions, (and yes, even God, for those Richard Dawkins fans who have managed to read this far) require an explanation. It would be silly to say that something, say, a table, just existed for no reason. Everything must have an explanation, whether in the necessity of its’ own nature, or in an external cause. The second point that I want to make is that human beings somehow grasp these true propositions that exist as a brute fact. Assuming that atheism is true, then human beings arose as a product of natural causes, crawling out of the pond and fighting for survival for millions upon millions of years until we reached our status as full-blown homosapiens. What good reasons are there to think that these creatures would be in touch with true propositions? True propositions are just metaphysical realities that exist beyond the space-time reality. Why should pond scum know them or have the capacity to reason about them? If true propositions are a brute fact, we should have never discovered that they are a brute fact. In an earlier paragraph about the nature of true propositions, I pointed out that in the absence of time, space, matter, energy, nature, and the universe, there would still be a true proposition regarding the non-existence of any of these entities, or of their future existence. You began to wonder about whether the same principle would apply to the existence of God. 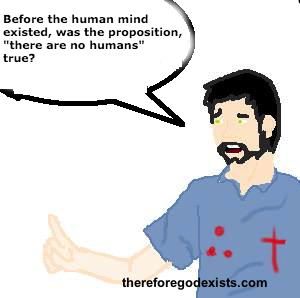 If God did not exist, would the proposition, “God does not exist” still be true? If it did, then true propositions would transcend God, would they not? There are two points that we may make in way of responding to this objection. First, if God is the necessary explanation of true propositions, then the proposition “God does not exist” could never be true. Think for a moment about the nature of a true proposition. They are timeless, spaceless, immaterial, supernatural, and even metaphysically necessary (in every possible world, true propositions would exist). What could possibly explain something such as this? True propositions must draw their nature from or be apart of the nature of something that is also timeless, spaceless, immaterial, supernatural, and metaphysically necessary. Further, we may also postulate that this being must be omniscient as well, because he possesses all of the true propositions. But an omniscient being is also a personal being. Therefore, we may conclude that there exists a timeless, spaceless, immaterial, supernatural, metaphysically necessary, omniscient, and personal being. Let’s not fool ourselves. This leads inescapably to the conclusion that therefore, God exists. Therefore, if atheism is true, it follows that atheism is false. Can A Universe Emerge From Absolutely Nothing?